Easy, gluten-free and EGGLESS Brazilian cheese bread (Pão de Queijo) made with tapioca flour, sour cream, and Parmesan cheese. 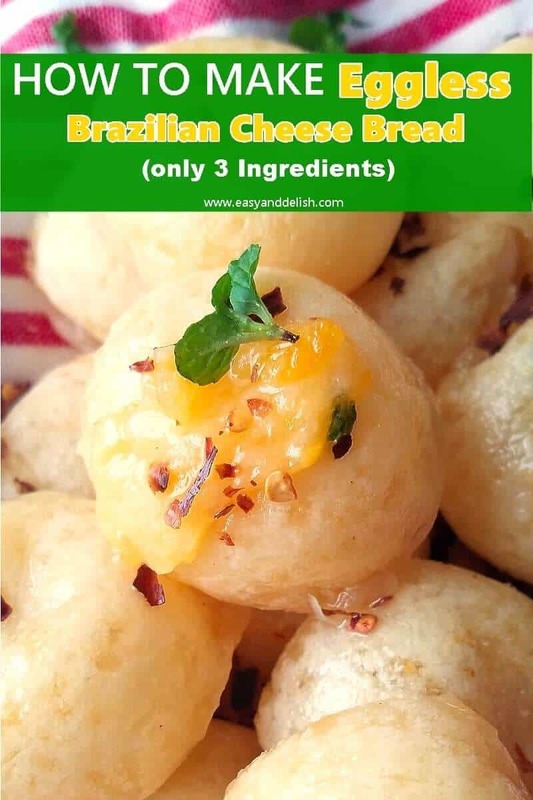 For those who are not familiar with pão de queijo (meaning, cheese bread), these are small puffy cheese rolls made with tapioca flour and cheese. … although it became widely popular around the 1950s, as noted by Wikipedia. 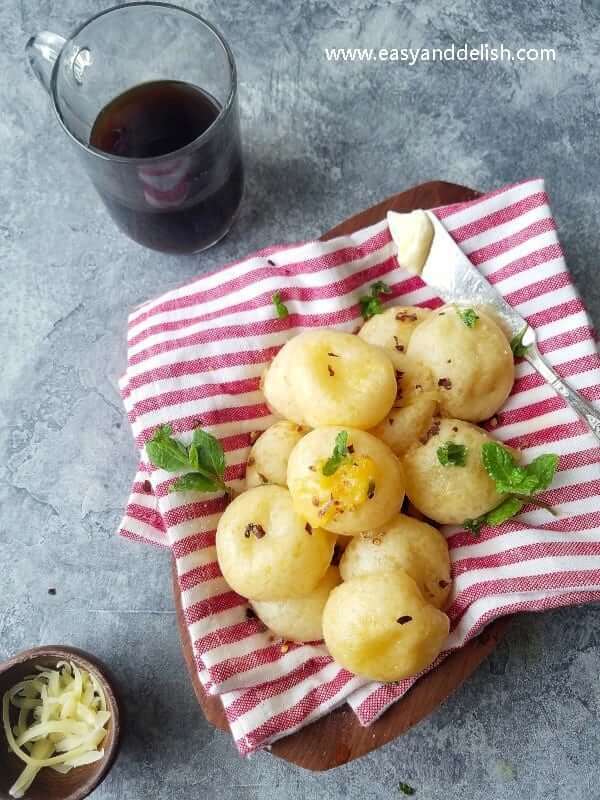 Aside from all of its different variations, traditional Brazilian cheese bread is made from tapioca flour, vegetable oil, milk, eggs, salt, and cheese. The traditional Brazilian cheese bread recipe uses Minas cheese (meia-cura type; meaning “half-matured”)– while some variations call for Parmesan cheese. And no, the artisanal Minas meia-cura does NOT taste like Mozzarella, as some allege. It has a rather distinctive smell and tangy flavor– like nothing else that you have ever tasted! But our eggless Brazilian cheese bread is made with only 3 ingredients: tapioca flour, sour cream, and Parmesan cheese. Salt is optional here! These are denser and chewier than the airy and puffy traditional pão de queijo — but still very tasty!!! They are chewy on account of the tapioca flour, making Brazilian cheese bread perfect for those on a gluten-free diet. In contrast to the traditional Brazilian cheese bread, there are NO eggs in this recipe! 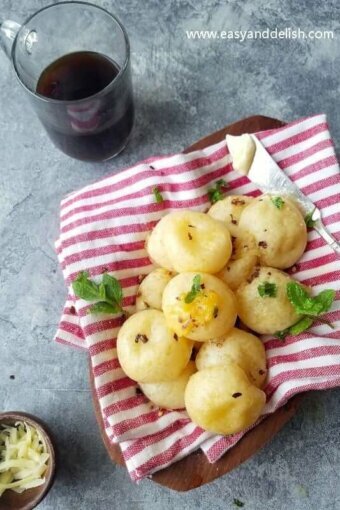 As with the traditional cheese rolls, you can serve them for either breakfast or as an afternoon snack accompanied by coffee. 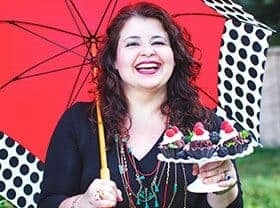 Well, are you ready to prepare these heavenly bites? Preheat the oven to 350 F and line a sheet pan with parchment paper. Mix the tapioca flour, sour cream, and Parmesan together until homogeneous. The consistency is right when dough does not stick to your hands. To achieve this, you can add 1 to 2 tbsp tapioca flour, if necessary. Using a tablespoon as measure, scoop out the dough and roll into balls. Use extra tapioca flour to prevent the dough from sticking to your hands. Either bake or freeze them in a plastic bag. Place rolled eggless Brazilian cheese bread onto lined baking sheet, spaced at least 2 inches apart . Bake on the middle rack of the oven for 18-20 minutes. In the meantime, do NOT open the oven door (in order to allow them to rise)! Remove from oven and serve immediately, accompanied by coffee. If baking from frozen, it will take about 25-30 minutes in the oven to be ready. Do you love Brazilian cheese bread? Also try our Waffle Pao de Queijo and our Cheddar Filled Brazilian Cheese Rolls !! Preheat the oven to 350 F and line a sheet pan with parchment paper. Mix the tapioca flour, sour cream, and Parmesan together until homogeneous. The consistency is right when dough does not stick to your hands. To achieve this, you can add 1 to 2 tbsp tapioca flour, if necessary. 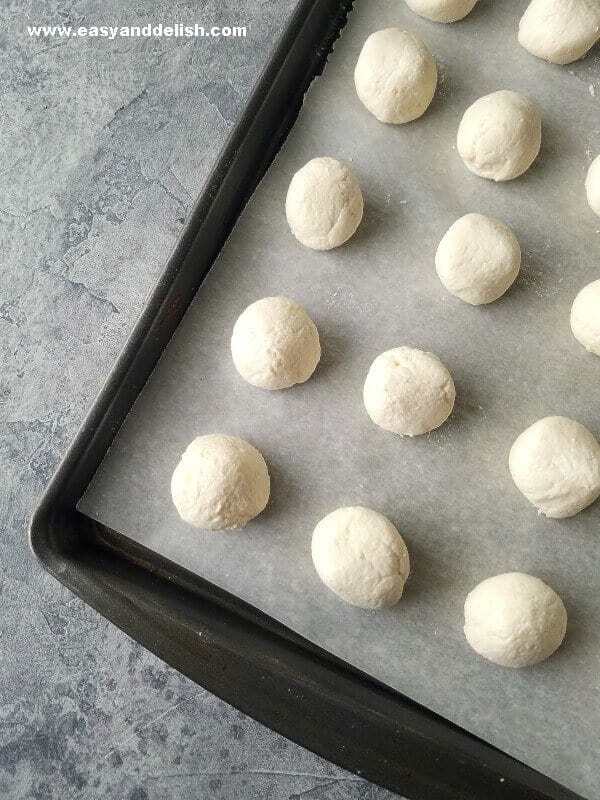 Using a tablespoon as measure, scoop out the dough and roll into balls. 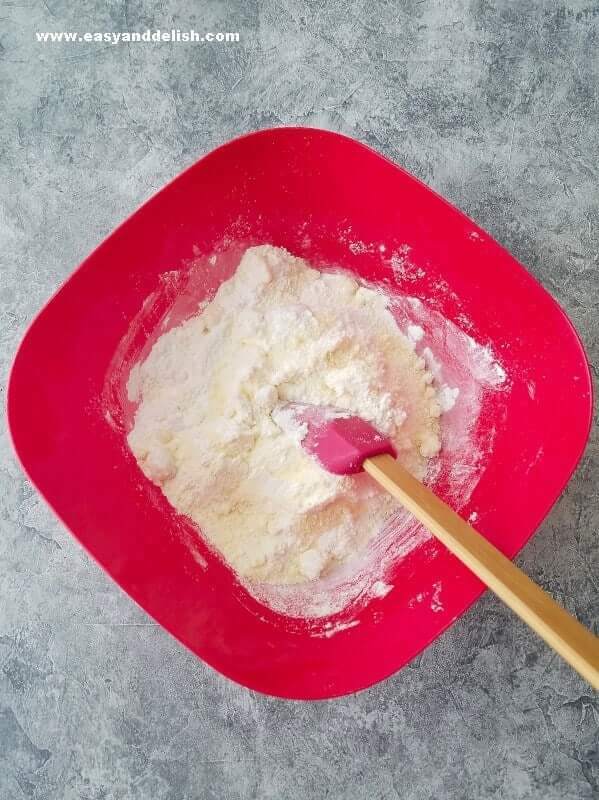 Use extra tapioca flour to prevent the dough from sticking to your hands. Either bake or freeze them in a plastic bag to bake later. Place rolled eggless Brazilian cheese bread onto lined baking sheet spaced at least 2 inches apart. Bake on the middle rack of the oven for 18-20 minutes. In the meantime, do NOT open the oven door (in order to allow them to rise)! Remove from oven and serve immediately, accompanied by coffee. Do you love Brazilian cheese bread? Try also our Waffle Pao de Queijo and our Cheddar Filled Brazilian Cheese Rolls!! I’ve not had this bread before…they sound very interesting. As far as I know, I’ve never had a dish prepared with tapioca flour before. Hi, Karen! This bread is very popular at churrascarias or Brazilian steak houses. It is gluten-free and absolutely addicting! Such a tasty new-to-me cheese bread! Tapioca flour adds a soft and melt in your mouth texture to this easy recipe. Neat dish, and one that’s new to me. And easy! This looks like a winner — thanks. Were delicious! Going to make them was wondering if I could use cassava flour to make them more nutritious and if anyone has tried it how much do I use? Hi Sats! I have never used cassava flour to make these, only tapioca flour which is a derivative from cassava root vegetable.